Whenever you work with others on your invention, you risk losing your invention rights. For example, collaborators (i.e., co-inventors), investors, independent contractors, employees might end up owning, inadvertently or unintentionally, a part of your invention when you engage them to help you. This might destroy the value in your invention. Let’s take a co-inventor situation which could occurs whenever you collaborate with others (e.g., independent contractor, friends, colleagues, etc.). Because co-inventors can exploit your technology without any responsibility to you, this would destroy the value in your invention and cannot be allowed to happen. The surprising thing is that you might not even know that you have a co-owner. Below is an extensive discussion on the other types of relationships or individuals and how to mitigate the risk of losing your intellectual property. Many times, startups lose invention rights because they don’t know the law and what they need to do to protect themselves. You need to know how to protect yourself so that if and when you do work with others, you will own all of the invention rights. 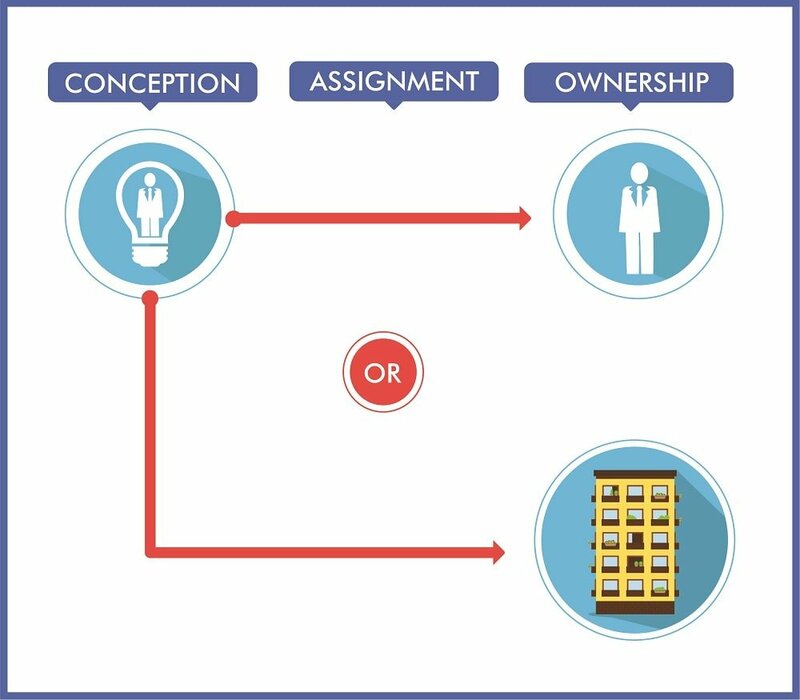 How is ownership of invention rights determined? Invention rights vest (i.e., belong) to the inventor(s) who conceives of the invention. In other words, who thought of the invention? The rights to the invention may be transferred to another entity by “assignment.” An assignment is an agreement to transfer the rights from an assignor to an assignee. To determine who owns the invention, the analysis starts with a determination of who conceived any part of the invention. Everyone that contributed to the invention is part of the inventive entity. Next, you would look to whether there was an assignment from any of those inventors to anyone else. For example, for startups, the inventor may need to hire one or more engineers to help design and build the product. If the engineers contribute to the invention, the engineers along with the original inventor may form the inventive entity. More on this later but the original inventor should require the engineers to assign any ideas that they contribute to the invention back to the original inventor. Now, before you read any further, there is a distinction between co-ownership of an invention or patent and ownership of shares to a corporation which owns the invention. In the latter, you do not own the patent or invention rights. Rather, the corporation owns the patent rights. The significance of this difference is that if you own shares of the corporation then you cannot harm the invention rights because you would owe a duty of loyalty to the corporation. In contrast, if you own the invention or patent rights, then you don’t have a duty to maintain the value of the patent. You can dedicate it to public if you desire. Ownership issues arise in business because collaboration with others is often required to bring an invention to market. As in our example above, inventors may need to hire engineers. They may also need to retain manufacturers, product development companies, and others to help them develop the invention or product. They may also reach out to investors that might require control of the invention rights. The discussion below addresses ways to mitigate ownership issues for each type of relationship. Co-inventorships might arise inadvertently. For example, a common way is if you were to share your idea with someone and they provide feedback on your device. If that feedback contributes to your invention, you now have a co-inventor who now co-owns the invention and can exploit the invention without you. Normally, this inadvertent type of co-inventorship situation arises when a close friend provides feedback on your invention. Your friend is just providing some friendly advice and feedback and might, at the time, have no desire to be a co-inventor. However, the law is clear that co-inventorship is not based on the intent of the parties but rather on whether a person contributed to the invention. Let me explain why having co-inventors is problematic. Everyone that contributed to the invention is collectively known as the “inventive entity.” Unless otherwise agreed, each inventor included in the inventive entity owns the invention. Under United States law, each inventor can market and sell the patented invention without accounting for, or sharing, his or her profits with the other inventor(s). 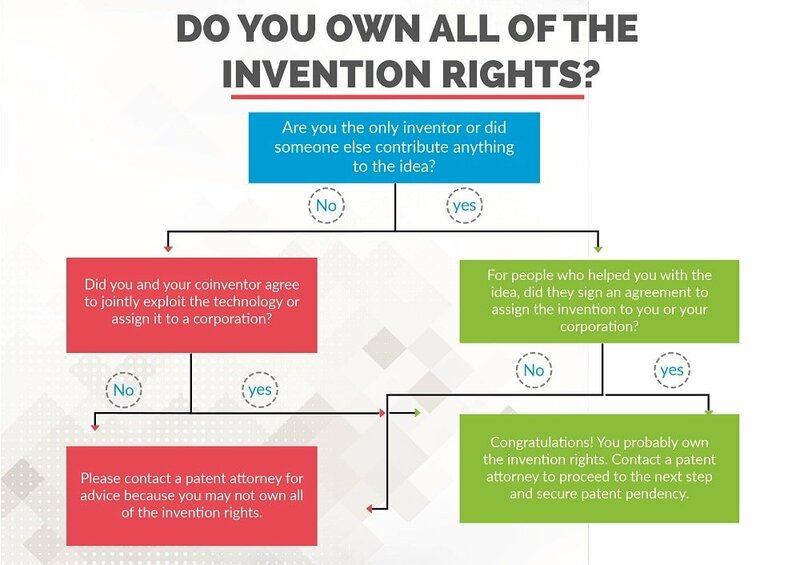 Additionally, any of the inventors can act against the interest of any other by dedicating the invention to the public (i.e., allowing it to be designated part of the public domain) even if the other co-inventor does not consent. Even if the relationship of the co-inventors may be friendly in the beginning and each of the co-inventors may think that he or she does not want to harm the others, over time, feelings may change. Business pressures and personal problems may impose new duties and obligations on the co-inventors. Fights and disagreements may cause co-inventors to have very different views on how to commercialize the patent(s) or market products under the patent. If you find yourself in a co-inventorship situation, you need to seek the advice of a patent attorney so that he or she can advise you properly on next steps. The patent attorney will provide you with guidance on how to deal with your new found co-inventorship situation. One solution to mitigate potential future disagreements between co-inventors is to enter into a “joint exploitation agreement.” In this agreement, the co-inventors mutually agree that they will not dedicate the invention to the public and do other things that might jeopardize the value of the patent. Another common means of protecting co-inventors and the value of the invention is to form a corporate entity (e.g., an LLC, S Corporation, etc.) and assign the invention rights to the entity. In this case, the co-inventors can split ownership shares as they see fit, and through the corporate structure, determine the rights and responsibilities of each of the co-inventors. This can deter inventors from harming the invention owned by the business due to their duty of loyalty to the company. The company can thus control what is done with the invention. Quite often, inventors want investors to come in and invest their money to help them monetize the invention. Ownership conflicts may thus, arise in these inventor–investor relationships. An inventor contributes the invention rights to the business while the investor contributes monetary funds. In other words, the inventor puts forth sweat equity and the rights to the invention, whereas the investor puts forth capital. At this point, the inventor owns all the inventive rights, but the investor also wants to control the invention rights if they are expected to invest in the invention. Otherwise, after the investor puts in his money, the inventor could walk away with the invention after receipt of the money. The inventor should not assign the invention rights to the investor. Assigning some of the rights simply creates a co-ownership problem. Plus, the investor is technically not an inventor. Assign all of the invention rights to the investor is also problematic. If the investor is assigned one hundred percent of the invention rights, the investor can sell or license the rights to the invention to a third party without compensation to the inventor or start a new company without the inventor. Both scenarios are not good for inventor and the investor. To resolve the dilemma, the inventor can assign the invention rights to a corporation, into which the investor invests. At the corporate level, the shares, money, and/or employment opportunities can be divided between the investor and the inventor, and the rights and responsibilities of everyone involved decided. Both the inventor and the investor now have a duty of loyalty to the corporation and should work toward increasing the value of the invention through the corporation. When you hire consultants, engineers and designers, ownership issues may arise. How? You are hiring them because of their ability to solve problems. In this regard, their solutions to your problems are all potential inventions. Because inventive rights vest with the person that conceives of the invention first, unless an assignment occurs, an independent contractor who conceives of an invention, even a small part, owns his or her part of the invention. If that part of the invention is incorporated into your patent application and the application later matures into a patent, the independent contractor is now a coinventor and owns the patent with you. To avoid co-ownership situation with independent contractors, the inventor should request that the independent contractor transfer the rights to any of their ideas to you through an “invention assignment agreement.” In this agreement, the independent contractor “agrees to assign and does hereby assign” the inventive rights to the company if and when the independent contractor conceives of an idea that improves your invention. This is a common requirement in independent contractor agreements and many independent contractors do not take issue with signing such agreements. That is, of course, unless the agreement is so broad that the independent contractor would be precluded from seeking work from other companies. The agreement should be reasonable in scope and seek only to assign those inventive rights applicable to the job they were hired for to the hiring company. Just to clarify, co-inventorship cannot be avoided in this situation but co-ownership can and should be avoided. If the independent contractor contributed ideas to improve your invention, that person is a co-inventor. However, through the assignment, the co-ownership of the invention is avoided. You are paying the independent contractor to create and develop your idea and should be able to own and exploit their improvements to your invention. Many companies at their inception are small and funds are tight. These companies may not have formal employer–employee agreements, wherein the employee agrees to assign all invention rights to the company. In the beginning, these startups may rely on the friendship that they foster with the employees. As companies grow, they may continue to rely on goodwill and tight-knit relationships between employers and the employees. However, this goodwill is not enforceable in a court of law. Companies need to plan for conflicts with its employees. An invention assignment agreement is one of the agreements that will avoid problems with employees. The invention assignment agreement is an agreement signed by the employee as a condition for employment. The employee promises to assign any invention rights to the company. Employers should enter into an invention assignment agreement with employees. Without it, the employee may retain his or her invention and the invention rights would not actually belong to the employer. These assignment agreements are desirable for project developers, sales personnel who come up with ways to improve the company’s product, and/or employees involved in manufacturing who might have insight into the most efficient way of making products. This is one area where there is a cross over between an employment attorney and an intellectual property attorney. In most instances, if you are looking for an invention assignment agreement for your employees, then you are also probably looking for other employment agreements. As such, it would be more efficient to retain an employment lawyer to prepare all of the form documents that you want your employees to sign.